The following is the text of an open letter sent to the President of the University of Paris-8 by a teacher in visual arts. She’s losing her job because of a particularly Kafkaesque circumstance: she doesn’t make enough money from art to maintain her tax status as an artist, and in France there’s a regulation that says you have to have a “principal occupation” to work as an adjunct. At any rate, this text, which tends to express its outrage through repetition and irony, is a particularly rich example of the emotional consequences of precarity. The honor I feel in writing to you is coupled to the hope that you will be able to spare a few moments. In terms of the facts, all resemblance to the life of Christine Coënon is not accidental; in the form of the writing, all resemblance to John Cage’s Communication (Silence, Denoël Press, 2004) is not accidental (in italics). I am a visual artist, an adjunct [chargé de cours] in Visual Arts [Arts Plastiques] at the University of Paris-8 since 1995. I am 48 years old. High school diploma in 1980, two years of college (Caen, 1980-82), five years in art school (Caen, 1982-87) and then the Institute of Higher Studies in Visual Arts (Paris, 1988-98). Holding a degree in art (DNSEP, 1987), more than twenty years of research and artistic production, fifteen years of teaching at the University of Paris-8… my pay as an adjunct in visual arts is rising to 358€ per month. What if I ask 32 questions? Will that make things clear? Every week I teach two classes, a practical and a theoretical class, which comes to 128 hours of teaching per year. Do you think my pay is fair, compared to the pay of a tenured professor whose hourly quota is less at 200 hours? The adjunct is paid for the time spent in class: two and a half hours, although the time slots are currently three hours long. Should I refuse to answer questions after class? And course preparation? And correcting people’s work? And grading? And tutoring the seniors? What is the difference between an adjunct and a baby-sitter? In 2005, the semesters were changed from 15 weeks to 13 weeks; after which adjuncts were paid for 32 hours instead of 37.5. 32 = 13 x 2.5? Why didn’t someone teach me to count? Would I have to know how to count to ask questions? Why, when a visiting lecturer [vacataire] gets a gross hourly wage of 61.35€, am I getting 40.91€ (compare to the rate of a visiting foreign lecturer)? I was told that the hourly rate of 61.35€ corresponded to what an adjunct costs the university. So if I just add the bosses’ overhead to my own salary, everything adds up. Do I understand that adjuncts are supposed to be paying the bosses’ overhead? These things that are not clear to me, are they clear to you? Do you think it’s fair, this special system? Why don’t adjuncts, who agree to work for a trimester or a year, get contracts? If I start a semester, am I just supposed to imagine that I’ll be there at the end? The same thing for a year? Is there any point in asking why? Why is it that an artist must have money to make money? Why does Visual Arts at the University misrecognize the artist’s situation, characterized by precarity? Is an artist who has “insufficient earnings” insufficient? Why do I have the feeling of only being a chit for the accountants? Why is the teaching artist considered “lucky” to get underpaid for teaching only if her research is profitable? Why, paradoxically, does the University only recognize artists’ sales, and under no circumstances their research and teaching? (I’ll permit myself to mention that in 2008 I got a research fellowship from the National Center of Visual Arts [CNAP]). Is this the 28th question? Have we got a way to make money? Money, what does it communicate? Which is more communicative, an artist who makes money or an artist who doesn’t? Are people artists within the market, non-artists outside the market? And if people on the inside don’t really understand, does that change the question? Why? Because I was invited there and, naturally, I found myself a place there. I say “naturally” because, whether at an Art School or at the Institute for Higher Studies in Visual Arts, I have always felt a complementarity between the historian and/or theorist and the artist. Too naturally, no doubt, I got invested and, too passionately, I have continued in the conditions that you know. Is there always something to wonder about, never peace or calm? If my head is full of uncertainty, what’s happening to my peace and to my calm? Are these questions getting us somewhere? And if there are rules, who made them, I ask you? In other words — is there a possible end to these uncertainties and, if so, where does it begin? Are there any important questions? 60% of teachers in visual arts are precarious, their pay rising a few hundredths of a euro each year. I ask you, given that experience emerges over time, what will happen if experience is sacrificed for momentary profit? Mr. President, I hope that you will be able to understand these questions, and able to answer them too. I inform you that in spite of the recognized interest in my classes, they are going to be canceled because I am subject to the House of Artists system (which is not even a professional obligation for me), and my earnings are below the threshold for being a full member. “Fired for insufficient earnings”: my courses are being canceled because my earnings are too low. Faced with the aberration of this situation, and without a response on your part, I will choose to make this letter public on May 19, 2011. Contemporary commentators often give us the sense that the increasing precarity of academic work is a recent and novel phenomenon. As I’ve noted before, in the American case this sometimes seems to rest on the historically inaccurate fantasy of a previous Golden Era of tenure, even though tenure, on further investigation, was apparently a rather recent invention that only became widespread in the post-1945 period, only lasted a few decades, and never covered all academic staff anyway. Don’t get me wrong; I’m not saying that there aren’t ongoing degradations in the conditions of academic work; the last twenty years have not been pretty in terms of US academic employment. Things look particularly grim in Britain this year, given the threats of 80% cuts in public university funding; in spite of the fantasy that tuition will increase to compensate, it’s easy to imagine that many humanities departments will be closed down. (Or already have been.) And as I’ve discussed before, France has seen a growing discourse on academic precarity the last year or two. But it may help our sense of historical consciousness to discover that even a hundred years ago, some people already had a fairly clear discourse on precarious intellectual work. 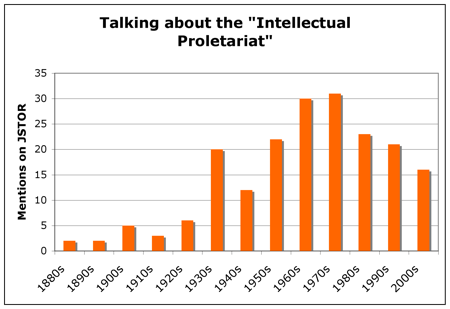 I’m not a historian and I can’t pretend to give the whole picture, but if we search on JSTOR for “intellectual proletariat” the first use of the term is as early as 1884, and the term has been used occasionally ever since, being used on average a few times per year in the scholarly literature since the 1930s. The fundamental cause of the poverty of Italy, according to Dr. Marin, is the faulty system of education. Numerous but poorly equipped universities train great numbers of lawyers and of doctors, who cannot find employment and form an intellectual proletariat. On the other hand, the few schools of agriculture, industry and commerce are scantily attended, and the instruction lacks a practical character. Reduce the number of universities, improve their scientific equipment, and introduce into every university thoroughly practical instruction in agriculture, industry, and commerce; work directly for economic development and social improvement will follow. Monday afternoon this week there was a big meeting in a fancy auditorium at the CRNS (National Center for Scientific Research). I say it was fancy because the audience’s chairs were padded bright red, a long coat rack held a long row of dark coats, and, unlike the plebian amphitheatres at the public universities, this room had a soft carpet. Everything was semiotically calcuated to make the afternoon’s discussion of precarity take place in an environment of visible luxury. The occasion marked the results of a major study on precarity in French higher education and research. Precarity, needless to say, can become a contested and complicated concept, and I want to write about this too but first I need to read more of the prior literature. But the funny part, as it turns out, is that the researchers themselves seem to have faced these very same agonies of literature review and conceptual clarification; and, wanting to avoid having to settle on a single definition of precarity, they decided to let precarity be defined by the research subjects. Hence if you considered yourself precarious, you counted as such in this survey, which had 4,409 responses and appears to be a fairly representative sample of French disciplines and institutions. In practice, I venture to add, ‘precarity’ seemed to come down to a fairly straightforward matter of having a temporary, hence unstable, job situation. The gist of the study is that precarity is rising fairly rapidly in this sector, the non-permanent workforce having for instance increased by 15.5% at the CNRS between 2006 and 2008, and university workforces currently being estimated at about 23% precarious (looking across all categories of university staff). The major findings of the report included a marked feminization of precarious jobs, a notable concentration of precarity in the social and human sciences (which Americans would call “humanities and social sciences”) in relation to the hard sciences, a definite group of young precarious workers (under 30) combined with a significant group of older “perma-temps,” a range of rather low wages (as someone put it rather sarcastically, temporary contracts are not being compensated for by better salaries), and, subjectively, a set of waves of anxiety and uncertainty about the future. As one would guess, there’s also a lot of struggling to make ends meet through multiple jobs (apparently a few even teach under assumed names, to circumvent age restrictions on some teaching assignments), a certain amount of disdain and nonrecognition from the tenured staff, and a set of inferior working conditions coupled to a lack of workplace rights in the face of the organizational hierarchy. I don’t know how I’ve gone this long without discovering Inside Higher Ed, but I’m very glad I finally have. This is clearly a hugely valuable resource and I appreciate it very much. I’ve been adjuncting @ 2 institutions for just 1.5 years now, after teaching as a grad assistant for 2, and am actively trying to figure out where the hell to take my career. The article here, as the others, and especially the dialogue in the comments are hugely valuable to me, not least because they just make me feel less alone in my outrage over the “white-collar Walmart” set-up, as another commenter coined. I looooooooooooove teaching, like crazy, and I don’t even want a PhD. It took me 9 years to complete my BS and MA altogether, I’m 36, and I’m tired. I just want to work & learn with students about textual meaning-making, and do my best to arm ’em with those literacies that will best empower them to get what they need/want. Before this gig, I’ve been a waitress for going on 20 years, a job I loved, but needed to get out of, due to a chronic injury and a certain amount of going stir crazy within its intellectual limits. Teaching gives me everything I love about waiting, without the arthritis, crazy hours, and bathroom-cleaning. The only seriously huge glaring problem, of course, is that waiting tables, I can and have pulled in a pretty comfortable, lower middle-class income, and get health insurance and a frickin’ 401k. Something’s gotta give, certainly. I have every confidence that somehow, I’ll make a career that works enough to avoid true abject poverty when I retire, and I’m even more positive that I will find a way to have fun while I do it. I knew what I was getting into, job-wise, when I went for the MA. But I’ll tell you what, if I hear one more tenured/tenure-track faculty at my 4-year institution cluck sympathetically at me about how awful it is that the life of an adjunct is so hard, but take absolutely no advantage of their position to advocate for any change in our treatment, I will lure them to the bar I still work at on the weekends, so I can throw a beer at them on my own turf.